A Little Secret Ritual With Your Insurance, Perhaps? Pictured here are two illustrations from the Ritual of the Equitable Aid Union, published in 1889. The book is similar to ritual books that Masonic and other fraternals organizations have either published or used, and which were especially in abundance in the late 19th and early 20th centuries. If you're unfamiliar with a ritual book (also often called a cipher, since they are/were often written in code), one can think of ritual books as scripts to plays, in a way – they contain the text of various ceremonies and dramatic, performance-based rituals that are performed, or enacted, at the official meeting of a fraternal group (like a Masonic lodge). Ritual books are used by those who are going to be performing the ceremonies as a script to memorize. 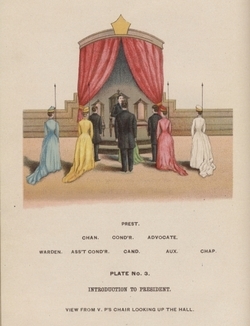 As with plays, they aren’t used when the actual ceremonies are enacted. This ritual is particularly interesting because it contains illustrations. Although many of the ritual books from this time period contain charts such as those that illustrate the layout of a room where ceremonies are to be performed, not many contain colorful illustrations that depict various parts of ceremonies. The Equitable Aid Union included four Masons among its founders. Its ceremonies, like many other fraternal organizations’ at the time, were patterned after Freemasonry. Mutual benefit societies not only provided relief in times of need, but, like Freemasonry, they also offered members the chance to participate in self-improvement activities, secret rituals, and social functions. Mutual benefit societies also promoted ideas tied to a self-reliant work ethic, as well as the idea that support (financial, social, etc.) might be more easily achieved when a group comes together, rather than by each individual working in isolation. Chancellor: Conductor, what say you of Equity? Conductor: Worthy Chancellor, if Equity in all its benevolent workings were to pervade the various ranks of our social life, rulers would not oppress their people, nor masters act unjustly towards their servants; nor would the people or servants refuse to submit to just and equitable laws, but all would act their part in this great moral machine, with harmony and delight, and every station in life would contribute to the prosperity and happiness of the other. 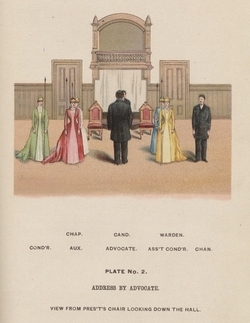 Ritual of the Equitable Aid Union for the Use of Subordinate Unions, Under the Jurisdiction of the Supreme Union ; Adopted at the Annual Meeting of the Supreme Union, held at Columbus Warren Co., Penn'a., March 1889. Titusville, PA: Equitable & Union Herald Printing House, 1889. Stevens, Albert C. The Cyclopaedia of Fraternities: A Compilation of Existing Authentic Information... of More Than Six Hundred Secret Societies in the United States. New York: Hamilton Printing and Publishing Company, 1899.